National memory is a funny thing. Some episodes are glorified far beyond their true impact. Others, no matter how all encompassing, are glossed out – the participants ignored and the deeds overlooked. World War one has traditionally been one of the latter. Until recently the estimated two hundred thousand men who served in British uniform during that war were but a forgotten footnote in Irish history. It is estimated that between 35,000 and 50,000 Irish men died during the war, tens of thousands were maimed and countless others suffered for the rest of their lives from post traumatic stress. For once they had returned home they found that no one not even their loved ones could understand the horrors that they had witnessed. Neil Richardson in his book A Coward If I Return A Hero If I Should Fall is determined to give those veterans a voice. A deceptively simple book, at first it appears that Richardson has chosen to tell the stories of a number of soldiers rather than to give a traditional linear account of the war. However, it incorporates not just the war but also its perception at home in Ireland and the traumatic effects of the war on the families of those who suffered from the effects of shellshock. 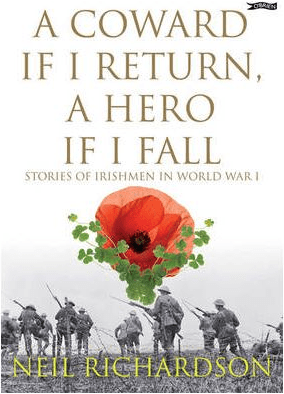 Richardson records the lives of a rare collection of Irish men, Catholic, Protestant and Presbyterian, telling the life stories of officers and private soldiers, artillerymen and infantry, pilots and officers batsmen. His book takes the reader across numerous campaigns; the bloodbath on the Somme, the disaster that was Gallipoli, the waking nightmare that was daily life in the trenches, where moments of sheer industrialised murder were interspersed by days, weeks and months of boredom where rats, lice, mud, mental fatigue and freezing weather dominated. Richardson effectively documents the terrible things men do during war. Some of the lives that he chronicles, Majors William Redmond and William Robert Gregory, Private John Condon, Father Willie Doyle are familiar but many of stories that he tells have never been previously documented. Such as that of the Rooney Brothers, Thomas and Peter, two Catholics who served in the predominantly Protestant 36th (Ulster) division. Most of the stories are tinged with tragedy; Robert Morrow wins the Victoria Cross rescuing wounded comrades only to be mortally wounded while doing so, Private Thomas Hope executed for being continually absent from duty. One of the books strongest moments is when it details the numerous different factors which encouraged Irishmen to join the British Army. Richardson deconstructs the traditional narrative that men joined because they were poor or because they believed that it would guarantee Home Rule or indeed prevent it. Richardson reminds the readers of the social context, that nothing is ever simple and neither are the reasons men go to war. His comparison with the Vietnam conflict is apt. Ireland suffered almost the same amount of casualties as the U.S. did during that struggle and when the soldiers returned they too faced a population embarrassed by their participation and all too willing to forget their sacrifice. His comparison with the Vietnam conflict is apt. Ireland suffered almost the same amount of casualties as the U.S. did during that struggle and when the soldiers returned they too faced a population embarrassed by their participation and all too willing to forget their sacrifice. This is a beautifully illustrated book and the photographs add to the immediacy of the stories. Some of the photos are horrific, especially those of trench foot and those of the dead. But in truth war is horrific and to gloss over the gruesome is to glorify it – something Richardson is determined to avoid. The text alongside the illustrations add to the power of the work, be it in the descriptions of the weapon photographed, the background to the regimental badges or the classification of the medal pictured. The addition of photographs of the individuals involved, their letters and postcards enhances their stories and brings the text to life. The book however is lacking in something, as there are no footnotes and even though the author lists all the service records, war diaries and interviews with the bibliography at the back of the book, the absence of footnotes is a major flaw in any historical work. The author’s determination to remember the dead sometimes gets the better of him. Occasionally he over emphasizes it when he doesn’t need to, the men’s own stories demand our attention. This is a beautifully illustrated book and an important one. Very readable, it offers something for both the academic and the layman. These are stories that needed to be told and Richardson is to be credited for doing so. One to be added to the collection of anyone interested in the period. Written by: Eoinpurcell on 14 December, 2010.on 15 May, 2011. 2 Responses to "Book Review: A Coward If I Return, A Hero If I Fall"